Red Baron are smarting from the shock of getting beaten by Titijaya on Game Day 9. It wasn't a good loss and the manner in which they lost wasn't very inspiring. Thus they needed a big result to get themselves back on track and who better to vent their frustrations on other then D-League whipping boys GoStrong. The Subang-based club, apart from some flashes of brilliance, has really struggled with the higher level of competition in the league. And they were really there for the taking as Red Baron, despite resting several regulars like Keng Eng Hong, Ng Zhen Yu, Zhi Wei Yap (193-C-00) and Goh Yan Qing, still managed to pound them really hard. Red Baron's strength in the competition comes from having a really deep squad with good talents. And the second stringers really stepped up when given the chance. After all, who doesn't want a chance to impress in order to earn more minutes. It was a blitz right from the start as Red Baron started aggressive and looked to cut out all of GoStrong's passing routes. Without Rais Davin Beg, GoStrong had no ball handler and the relentless pressure by Red Baron forced them into submission time and over repeatedly. It wasn't much of a contest in the end but Red Baron will be pleased with themselves for getting things done the right way without losing focus. 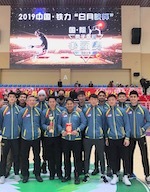 Wong Thiam Mun stepped up when called upon to finish with 19 points while Poh Chee Hoa and Fong Hao Seng also put in good shifts scoring 18 and 14 markers respectively. Titijaya had flexed their muscles when they took down the previously unstoppable Red Baron on Game Day 9. With their experience, taking out the rather inexperienced Westports Dragons would be very in order. Dragons' head Adrian Wong had already acknowledged Titijaya's prowess and wanted his boys to go out there and make things tough for the Ampang club. And for two quarters, the Dragons stuck to the game plan like glue as they executed every play almost down to perfection. They took their chances when it came and they limited the production of Titijaya's main dangerman Syahrul Ridzuan Rosli whilst also frustrating pretty much everyone else. But things just went south after the halftime break as the Dragons just forgot the gameplan. They only made one basket in the third period - a hook shot by Phan Ji Feng - and completely crumbled in the fourth period. With Titijaya looking to pull away after building a 43-32 lead, the Dragons pretty assisted them as they handed out turnovers in quick succession as Syahrul and veteran gunner Yeow Loong Ho (178-G-88) compounded their misery. The 30-year-old Yeow Loong still proved to be a hotshot as he fired off 18 points to lead the scoring while Syahrul had a quieter outing but still managed 15 points. For the Dragons, their main scoring came through point guard Leong Kar Fatt who sank 12 markers from 4-12 shooting. The win improved Titijaya's record to 4-1 for the season and moved them up to third in the table while the Dragons now drop to 3-2 for the season. The Dragons may have won 5 on the trot prior to this matchup but head coach Ee Kee Lip was flipping at his team's defensive efforts. His team of superstars were certainly slow to get the message across as they looked sluggish to start against a winless VAG. The Klang-team gave neutrals much to hope for in the first five minutes as they took the fight to the Dragons. But that was as far as they got as the Dragons awoken from the slumber and started to breathe fire. They quickly upped the tempo to lead 46-32 at halftime and there was really no turning back from there at that point. Despite the defensive vulnerabilities, the Dragons can certainly shoot and shoot well. So they did what they did best - put the ball in the net. There was really no way VAG, who are struggling at this level, could hope to stop the Dragons in the zone. And in the end it proved to be a comfortable victory for the Dragons as they improve to 6-0 to keep up the pressure on league leaders Red Baron. Tan Wei Jie, back from illness and in his first start of the campaign, put up a dominant display with 24 points while fellow Melakan Wee Yong Gan continued his hot shooting exploits with 22 points. The Dragons also had Joshua Gan firing 20 markers while Hung Ing Wai put in a decent shift with 11 points. For VAG, Tan Kim Yeow led the points with 17 markers while Lee Kok Loon dropped 16 points. This was an interesting matchup. Red Baron are on a great run coming into the match, 6-0 and top of the table. Titijaya on the other hand have shown that they can pick up the results when they need to. And more importantly, they were hungry to avenge an earlier 45-47 defeat to Red Baron a few weeks earlier. And they showed their determination early as their main men Syahrul Rosli Ridzuan and veteran gunner Yeow Loong Ho (178-G-88) put them up 15-5 before Red Baron reeled them back in to lead 22-21 at the first period. That was about as explosive the match could get it soon descended into a physical battle and a game of turnovers. TItijaya were however winning the bigger points and hitting Red Baron when it hurts most and they slowly inched ahead. They were also doing an excellent job of clamping down Red Baron's offence, even limiting them to a paltry 7 points in the third quarter. Syahrul was doing all the running and the damage and he was such an efficient player that Red Baron were running low on ideas to stop. They designated two-men to chase him out of the game but the 1.84m all-rounder was simply unstoppable once he got into the mood as Titijaya eventually ran out winners to dish out Red Baron's first loss of the campaign. Syahrul's all action display saw him top it off with 17 points, 9 rebounds and 6 assists while the 30-year-old Yeow Loong finished with 11 markers and 5 boards. Red Baron who played one of the worst offensive game, had Wong Mun Hin with 11 points and Yap Zhi Wei with 10. Poor GoStrong. They just can't seem to buy themselves a win at this point. With the Westports Dragons barely firing on all cylinders, this was a chance for GoStrong to nick a game and get on the board. They started strongly but the Dragons clawed their way back in with excellent big man display from the big man Lim Wei. It turned in a see-saw battle after the opening exchange but it looked like the Dragons would very much run away with it having built up a 12-point lead at point. But old habits die hard and the Dragons' have a terrible knack of letting opponents back into the game and that's just what they did. A better opposition would have put the Dragons to the sword. But GoStrong just lacked the quality in options and some general basketball smarts as they seemed to have given up on the ball game before they actually knew they could comeback. It wasn't until some frantic yelling by head coach Izzat Nasruddin on the sidelines that GoStrong snapped back into action. But it was too late by then and despite a nervy closing, it was the Dragons who took home a 5-point win. Lim Wei led the Dragons with 11 big points and 10 rebounds while captain Tan Wei Long put in 11 markers as well. For GoStrong, Rais Davin Beg was by far their best player finishing with 10 points and 6 boards. Lord Tiger, in their three matches during Week Three, have shown that they have the ability to challenge all comers. Titijaya on the other hand have not played since Week One where they registered a win and a loss. Thus it was the Sarawakians who were looking to exploit some match rustiness in their opponents as they stormed to an early 9-2 lead. Titijaya however reeled them in but both teams were tied 32-all at the break. The Ampang-based team however made good of their experience after the break and started to break away for a 56-43 lead. Lord Tiger gave a big effort in a final flurry but it was too little too late as Titijaya did enough to claim the win. Syahrul Ridzuan Rosli was again the all-action man for Titijaya as he finished with 21 points and 13 rebounds but also gave out 11 turnovers for a wrong end of a triple-double. Veterans Kwan Jo Ee and Ho Yeow Loong also pulled their weight to finish with 15 and 12 points respectively. For Lord Tiger. Maegen Mahadevan finished with 15 points despite flirting with foul trouble while Andy Jong put up 14 points. The early defeats of the season now seems like a thing of the past for Speed Hunters as they have slowly but surely picked up form. The youthful Speed Hunters, under the guidance of veteran coach Goh Cheng Huat are picking up steam having won their third match in a row. But this win didn't come easy at all as they were made to labour several tough situations against a gutsy VAG side. It didn't look that way at the start as Speed Hunters were quick off the blocks and raced into a 22-9 lead. They however, went to sleep after the first period and opened an opportunity for VAG to chase them back. And chase they did as VAG got more aggressive behind the ball as the game could well be forgiven for a wrestling match. Speed Hunters however handled themselves well under pressure and played the big points when it mattered. A big three-point dagger by Chong Koon Wei put the game beyond doubt before Gan Zhi Ying completed the win despite converting only three of his last six attempts from the free throw line. 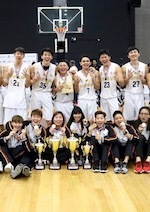 Zhi Ying would finish with 13 points and 9 rebounds while Koon Wei's clutch showing had him on 10 points, 4 boards and 3 steals. For VAG, Lee Kok Loon and Seow Young Lii both finished with 12 points while Yong Jian Teck dropped 11 markers. The win sees Speed Hunters improve to 3-2 for the season while VAG's struggles continues as they are 0-4.